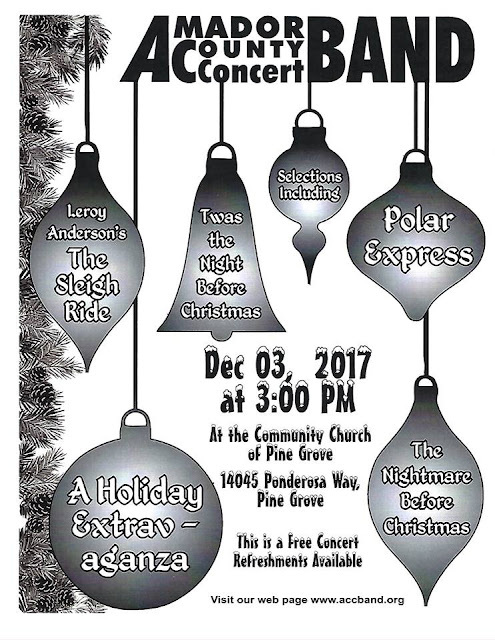 A free concert will be presented by the 46-member Amador County Concert Band under the direction of Steve Chambers on Sunday, December 3rd at 3pm. The program will be held at the Community Church of Pine Grove, 14045 Ponderosa Way, Pine Grove. Doors open at 2:30pm. Featured music will be a medley from “Beauty and the Beast”, the narrated “Twas’ the Night Before Christmas”, a medley from “The Polar Express”, “An English Christmas” conducted by student conductor Keith Traveskis, Leroy Anderson’s “Sleigh Ride”, a bass clarinet solo called “Basswood” featuring the band and our own Kate Storm, and more! The Amador County Concert Band proudly represented Northern California in June 2010, when it was selected to perform in Washington D.C. for the National Community Concert Band Sousa Festival, a salute to the legendary march king, John Philip Sousa. Under former musical director Ernie Kapphahn, the band gained very high recognition and since the band’s return, has gained new members, some traveling from as far away as Sonora, Placerville, El Dorado Hills, Cameron Park, and Sacramento. The band also performed last year at the Golden Gate Park Band Festival in June and played under the historic band shell. The Amador County Concert Band represented our Northern California area and was one of the largest ensembles to perform over the weekend, receiving a very special recognition award for an outstanding performance. The band was also selected to also perform in Carmichael Park on June 4th for a special one-hour concert. 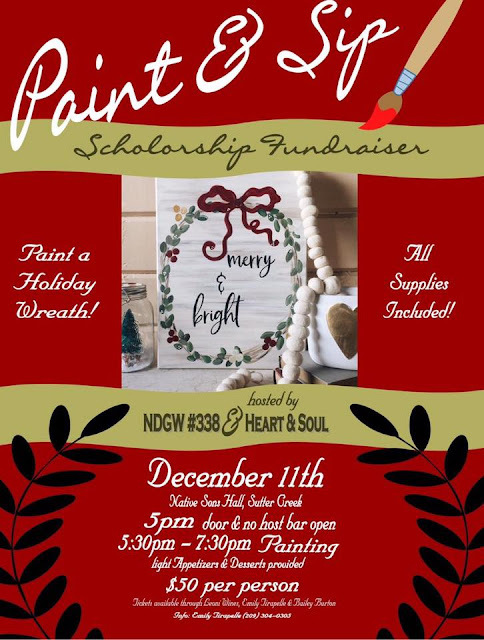 Join us on December 3rd for this wonderful free event. Doors open at 2:30pm so arrive a few minutes early for best seating….ample parking…music begins promptly at 3pm. Visit the band’s website at www.accband.org for additional information or to find out how to join the band. 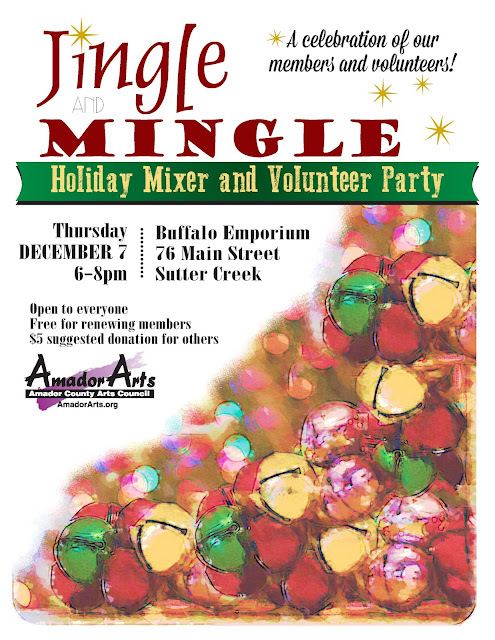 “Jingle and Mingle” at the AmadorArts Holiday Mixer and Volunteer Party on Thursday, December 7th from 6:00 – 8:00 pm. Everyone is welcome to drop by Sutter Creek’s Buffalo Emporium at 76 Main Street. Look for the bright red door! Guests will enjoy appetizers, liquid refreshments, and a Holiday Sing-A-Long hosted by the Student Directors of AmadorArts who are Lulu Briggs, Deja Douglas, Emily-Ann Hopkins, and Sid Cohen. AmadorArts’ Program Coordinator Meghan O’Keefe will also sing. The event is described as a Mixer for the Arts bringing everyone together. This one is honoring the many arts volunteers whose support keeps the non-profit ticking throughout the year. Entry is free for AmadorArts members and for those who renew that night, or a suggested donation of $5. The Buffalo Emporium, a restaurant and ice cream shop, is conveniently close to the AmadorArts Gallery at 11-A Randolph St., which will be open during and after the mixer to show off its “Holiday Adornments” show and sale featuring over 20 artists and their quality but affordable items for gift-giving. At any of these arts mixers, expect to see a variety of people. Of course artists of all types attend, but also business folks, retirees, young residents and more. AmadorArts, aka Amador County Arts Council, is a private, public benefit non-profit organization that has served the region with arts-related events and arts education since 1982. Phone: 209-267-9038 or visit its website www.amadorarts.org. 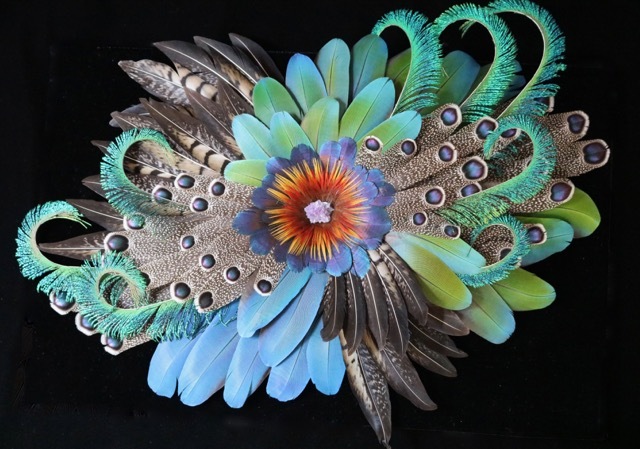 More artists have recently put their gifty art items in the annual AmadorArts’ Holiday Adornments Show and Sale in Sutter Creek. 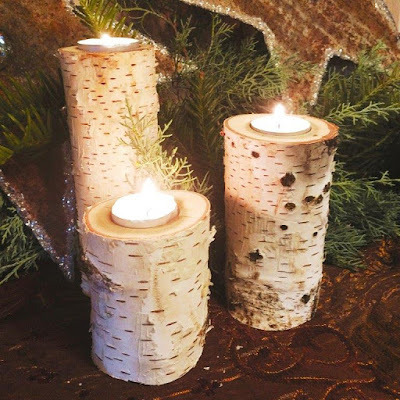 Now there’s an even wider selection of clever and affordably-priced gift ideas including ornaments, holiday decorations and cards, jewelry, wearable accessories and much more. Kathryn Devlin’s small ceramic figures are irresistible. 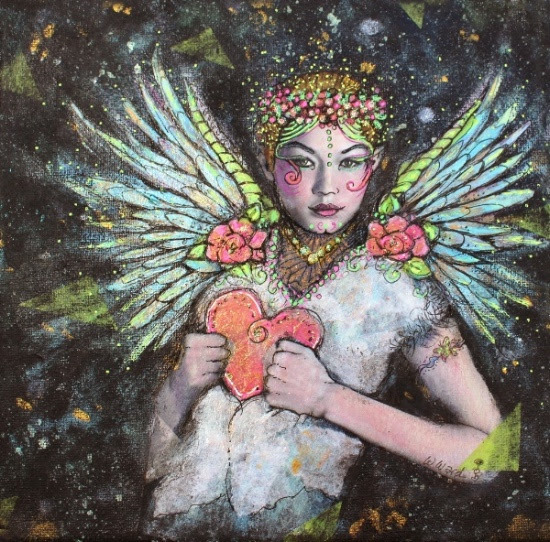 She joins the over 20 local artists who have been selected to show and sell. Millie Butler’s fresh wreaths continue to be popular. On Saturday, December 2, there will be a First Saturday reception, 2-5 pm. On Thursday, Dec. 7, during the Jingle & Mingle Arts Mixer, 6-8 pm, the gallery will also be open. Normal open hours will be on weekends, 11 am to 4 pm. Usually on weekdays, excluding Mondays, the gallery is also open when the admin. office is open, generally 10-3. Best to call ahead. 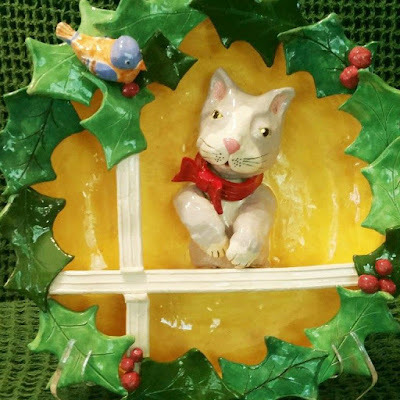 Remember, AmadorArts members receive 10% discounts, and you can join the day you shop. Get a head start on the season because this event has already opened and continues to December 23! 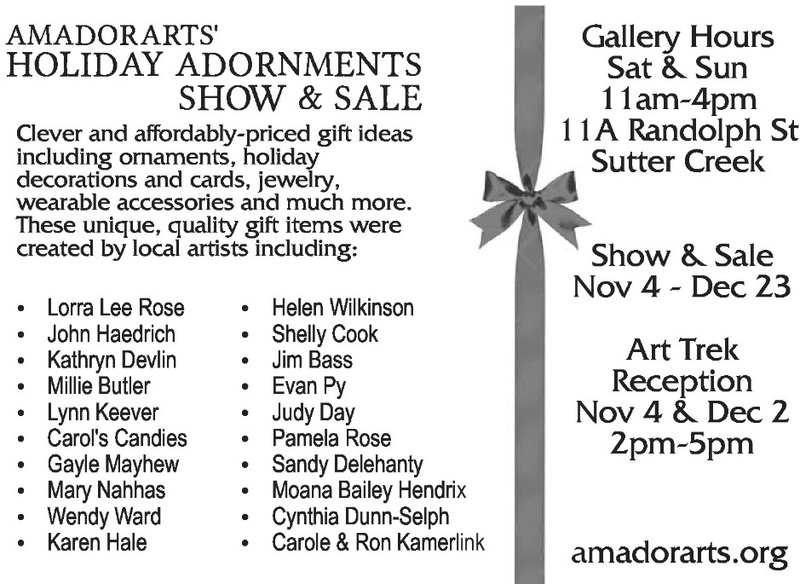 The AmadorArts Gallery is located in Sutter Creek, just a block off Main at 11-A Randolph. That’s the street where the new Buffalo Emporium with the bright red door is on the corner. Check Facebook or our website www.amadorarts.org for the latest details. 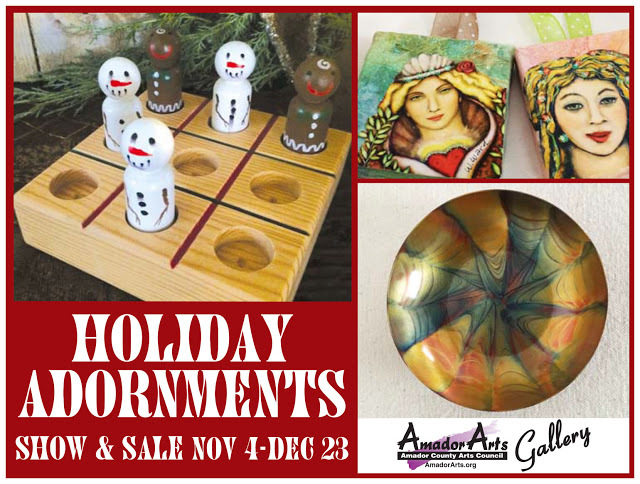 Put AmadorArts Gallery on your list of where to holiday shop for unique, affordable items. 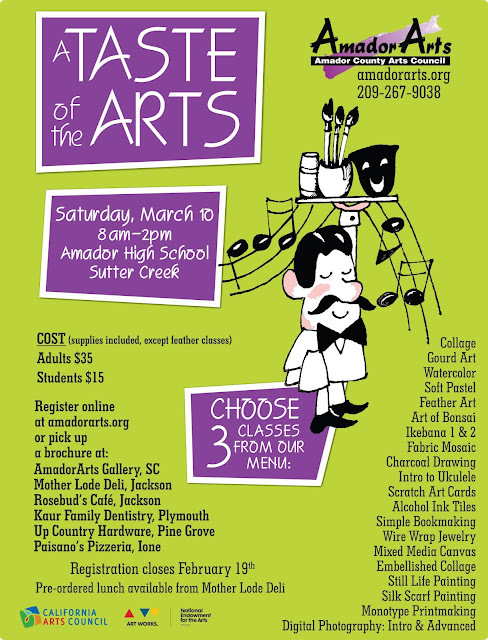 Visit www.amadorarts.org or call 209-267-9038. November, 2017 Sutter Creek, CA - Richie Stearns will play Feist Wines in Sutter Creek on Sunday, November 12 at 4 p.m. Stearns plays old-time Appalachian styled originals with a distinct, syncopated, rhythmic style. Stearns discovered the old time banjo when he was 14. He has traveled the world performing both traditional and original music. 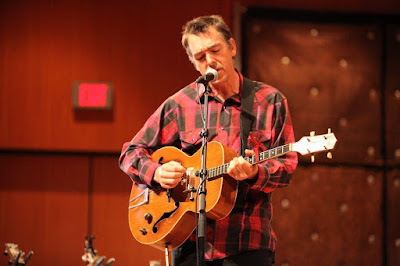 Over the past three decades, he has written original music for film scores and dance ensembles as well his own bands and collaborated with artists from a variety of disciplines. Two major long-term musical collaborations involve Natalie Merchant, three recordings and multiple tours and folk hero Pete Seeger. 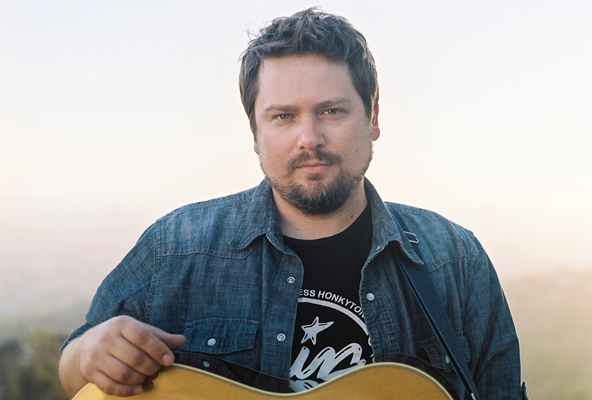 Over the past two decades, Richie has performed with Seeger on numerous occasions. His music takes listeners on a journey through love, heartache, sorrow and joy. There is ache and wisdom in Richie’s voice. That well is deep, Richie’s clawhammer playing is like no other: crisp, clean, melodic and wistful. His creativity and versatility make their presence known. A bonus for the audience is the stories behind the music: where the lyrics come from and what the songs mean to the artists. General admission tickets are $12 and are available at the tasting room or at feistwines.com. Get in the holiday spirit with an annual Christmas tradition. As they have for the past 54 years, Amador Choraliers will be presenting their winter concert, "A Timeless Christmas", December 7, 9 and 10. Concert-goers will enjoy many of the traditional standards such as "O Little Town of Bethlehem" and "Silent Night" as well as some newer favorites, "Grown Up Christmas Wish" and "Zat You, Santa Claus?". In addition, there will be some decades-appropriate versions of songs such as "Deck the Halls" . Cornerstone Church, Church and Market Street, Ione, will be the venue for Thursday, December 7th's concert. Doors open at 7 p.m. and the performance will begin at 7:30. Saturday and Sunday's, December 9 and 10, concerts will be held at St. Katherine Drexel Catholic Parish, 11361 Prospect Drive, Martell – Doors open at 2:30 with concerts beginning at 3:00. 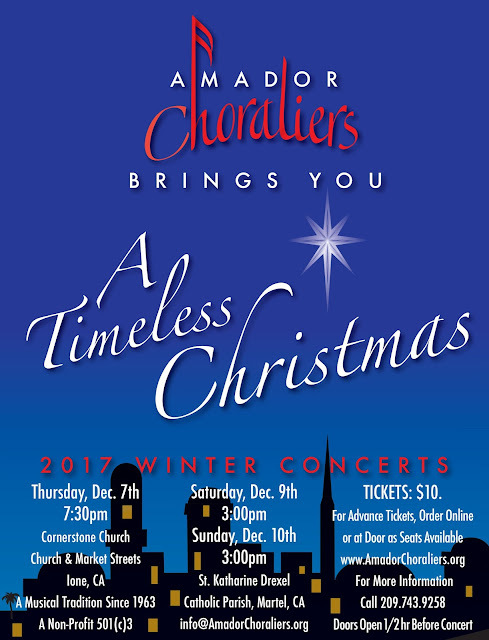 Tickets may be ordered online at www.AmadorChoraliers.org or can be purchased at the door as long as they are available. For more information, call Carole at 209-743-9258. Amador Choraliers has been a tradition in the county for 54 years. You are guaranteed to leave their concerts with a song on your lips and the Christmas spirit in your heart. 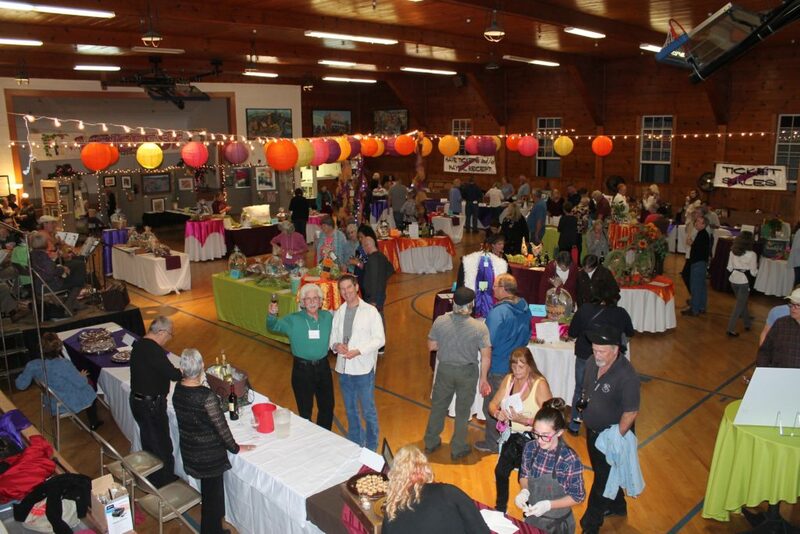 New details emerge about the 2017 Winefest in Sutter Creek on November 11. 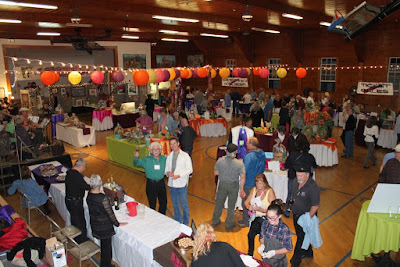 Local wineries, businesses and artists have all been extremely generous in donating high-end items to AmadorArts for this biggest fundraiser of the year! When guests make it back to the Sutter Creek Auditorium after tasting on Main Street, they’ll be able to place bids on a Stay & Play Package at the Jackson Rancheria Casino Hotel & Resort; a 2 night stay at Seascape Beach Resort in Santa Cruz; or on some super original large Gift Packages. The Art Silent Auction will be one of the biggest in 20 years with over 70 artworks, including a collectible by the late Stephen Matweyou, “Bridal Veil Falls,” valued at $2,700. 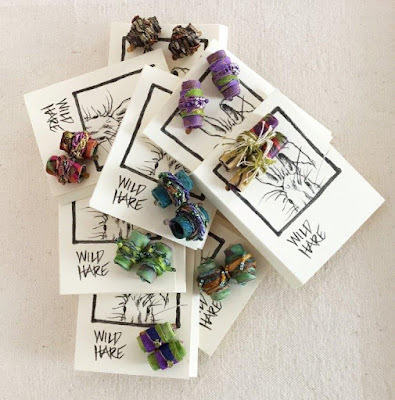 Other unique items include Wine Barrel Furniture by Mark Koenig, unique metal works, glass from Chaos, a handmade beaded coat by Sandra Wagner, rounds of Golf, a whimsical birdhouse by Kathryn Devlin, items for children such as unique toys and clothing, and adult art classes at the Heart & Soul Studio and Made in Amador. 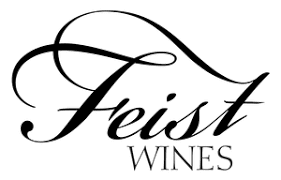 Wineries have donated some of their best cases, magnums, and single bottles for the Wine Silent Auction. For 20 years wine drinkers have been attending this walk-about tasting event to savor the wineries of Amador County, all within 3 blocks of historic Main Street. There will be 25 participating shops, each represented by a different vintner, plus the Sutter Creek Auditorium. That’s where to start at 4:30 pm to pick up your wineglass and that’s where to end up starting at 7:00 pm. Admission to this arts fundraiser is $40 in advance or $45 at the auditorium door. After sipping on Main Street, it’s back to the auditorium where live music by Primitivo, Latin Rhythms with Bill Russell and Dave Holob, accompanies the tasting of dessert wines and desserts. See and be amazed by the life-size Feather Fairy created by Lorra Lee Rose. 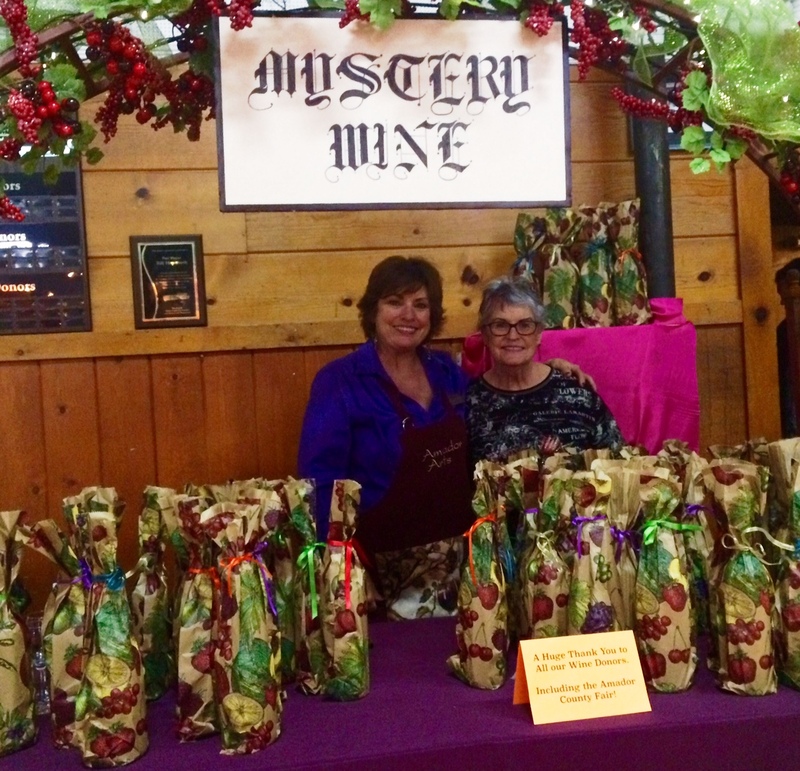 Also underway will be the popular “Mystery Wine in a Bag” auction. purchase a bottle whose value is at least $20, usually much more. By using a credit card through www.amadorarts.org , your printed PayPal receipt will be your ticket to save time at the auditorium’s check-in. Plymouth Family Dental, 9449 Landrum Street, Plymouth. The event is over by 9:00 pm. Proceeds of the Winefest provide much-needed funds for arts in education in local schools and in the community. 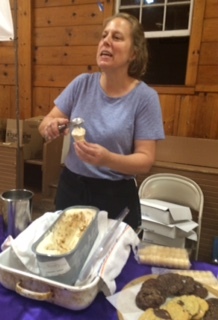 AmadorArts is a non-profit organization that has been serving the county for 35 years. Visit www.amadorarts.org or phone 209-267-9038. 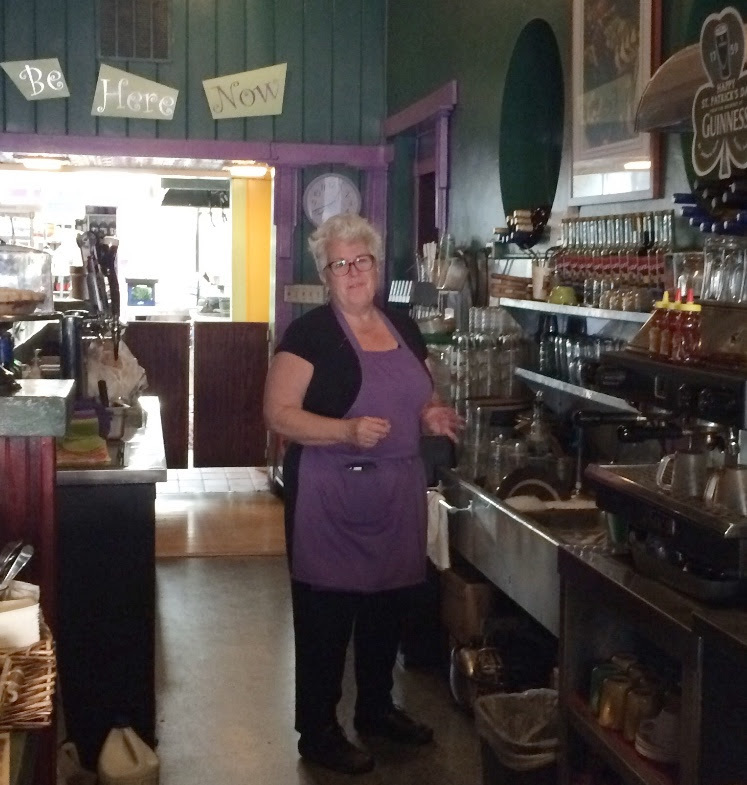 Good vibes abound inside the shops where wine is tasted. Greetings from the "Winter Faerie"! It's been awhile since I've sent out a mailer and gosh, I've missed you! I'd like to invite you to a reception this Sat., Nov 4 from 2-5pm at the Sutter Creek Gallery (35 Main St., Sutter Creek). I'm the Featured Gallery Artist for November and in addition to original acrylic paintings and prints, you'll see some new pillows with some of your favorite "Ladies" along with small collages, cards and other fun items. 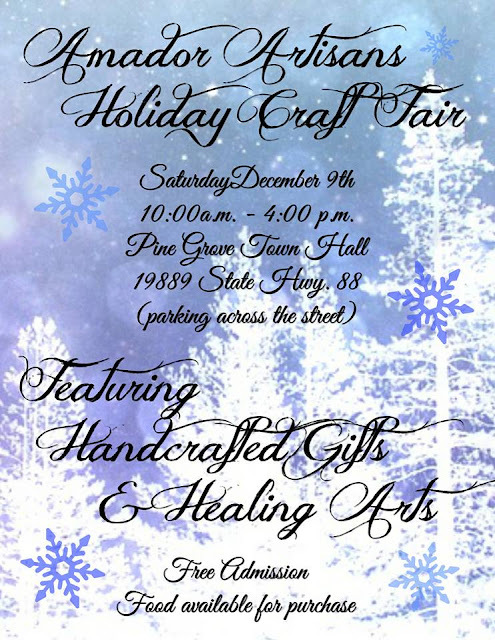 Mary Nahhas will be there with her gorgeous purses and totes incorporating my designs ~ time to think unique Holiday gifts! 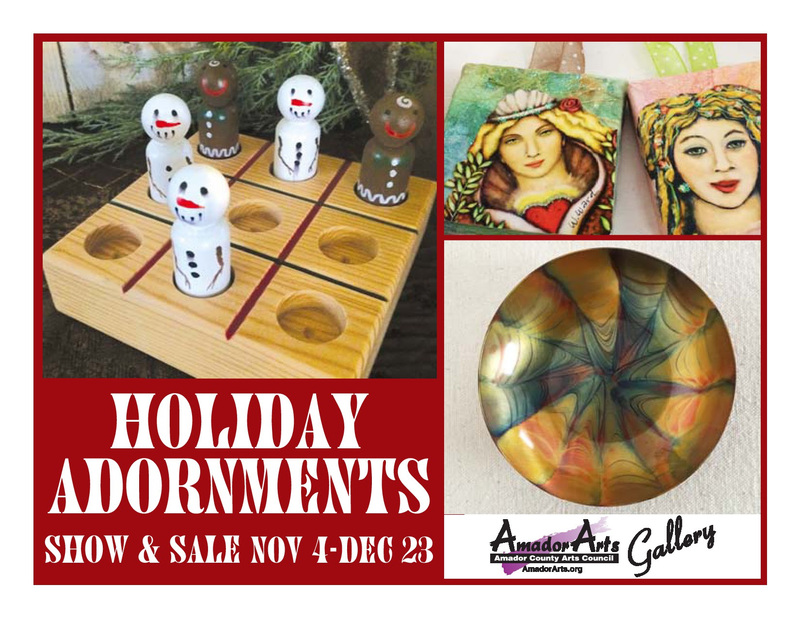 Once you've stopped by the Sutter Creek Gallery, walk down the street to the AmadorArts Gallery (Randolph St., Sutter Creek) for the opening of the Holiday Adornments show! I've created some sweet mini collage ornaments for AmadorArts Gallery to be included with 20 other talented artists. Thank you for shopping local and supporting the Arts! 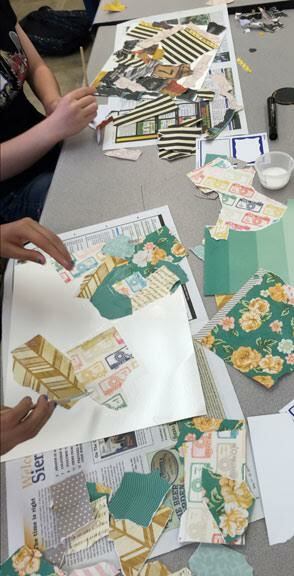 Another way to see local artists' work is through a program called Art in Public Places. 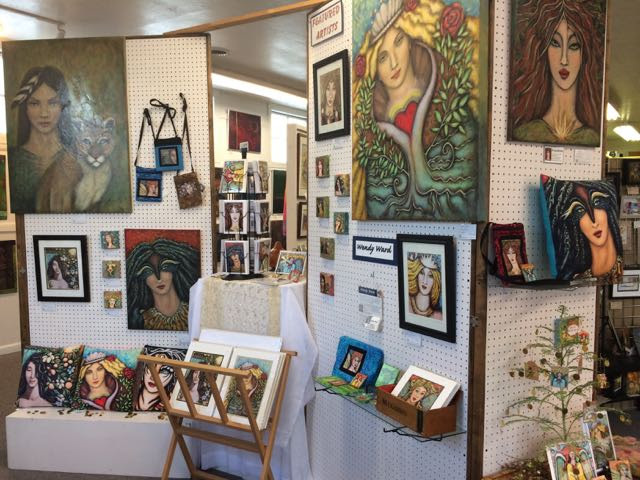 Various businesse s around Amador County provide wall space for the Artist to hang and sell their work. My work has been hanging inRosebud's on Main Street in Jackson during September & October and I thank them for their support and selling several of my pieces. During November and December I'll be hanging at Motherlode Deli, also on Main Street in Jackson. On Sat., Dec 2 I'm teaching a class at the Stockton Art League on Pacific Ave. in Stockton. 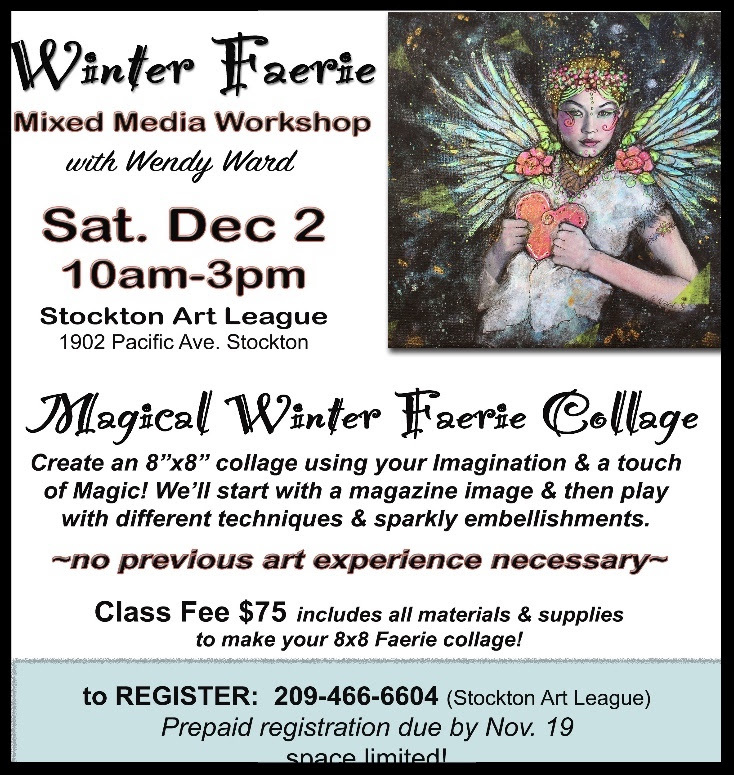 The theme is "Winter Faerie" and you'll create an 8"x8" collage using your Imagination and a Sprinkle of Magic! (relax...no face drawing needed!) 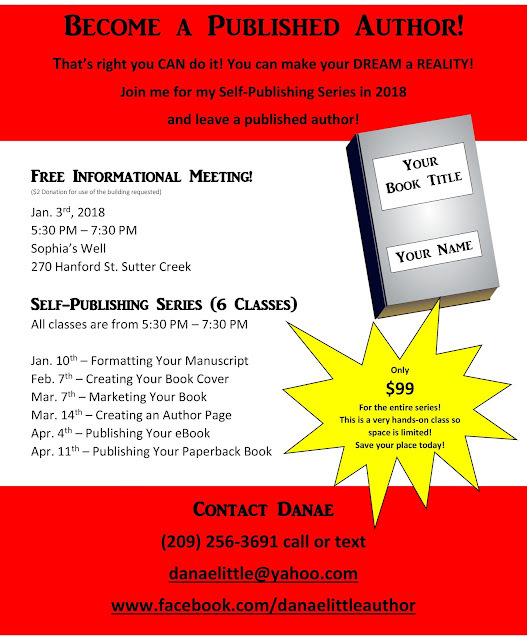 Pre-registration required & class size limited. Call 209-466-6604 to register before Nov 19.Another fun gift idea! I feel fortunate to have met some of you during art shows, others while taking a workshop either from myself or a guest teacher at my studio at the Red Corral in Pioneer and some have become very dear friends. Peace, Love & Good Cheer. Copyright © 2017 Wendy Ward, All rights reserved. You are receiving this email because you opted in during a class, special event, at the website or by special friend referral.